Nebraska homeowners who have discovered the joy of relaxing and entertaining in their backyards are often considering the next enhancement they can add to their outdoor space. Adding a pergola to your deck or outdoor space comes with a lot of benefits. 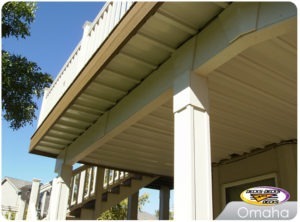 We’re known for installing elite custom decks in Omaha, but we can also build you a custom pergola. Let’s take a look at how a pergola can improve your outdoor living space. If you already have a deck or patio, one of the reasons you probably added it was to extend your outdoor living space. If you’ve been enjoying it, you might have found that during particular weather extremes it becomes uncomfortable to use. A pergola allows you to use your deck no matter what the weather is doing. It protects you from harsh sun rays in the middle of Summer and can keep the snow away in Winter. You can even outfit a pergola with retractable shade covers for more shade when you want it, and less when you don’t. A pergola can become the focal point for your outdoor living space. They can provide support for everything from chandeliers and ceiling fans to small speakers, strings of lights, and even fabric. Your only limit is your imagination. If you find yourself entertaining family and friends, or just enjoy spending time outdoors, a pergola is a great addition. Your pergola will be custom built with cedar wood. Cedar is a good choice for pergolas because of its natural insect resistance. It’s a beautiful wood that looks great right from the sawmill. If you leave it untreated, it will turn to a soft gray, or you can seal it to hold its color. If adding a pergola to your deck or patio sounds good then give us a call or stop by our showroom. We can show you a large portfolio of our completed pergolas and give you an idea about design options. This entry was posted in Custom Decks Omaha and tagged custom deck builder, custom deck builder omaha, pergola omaha, pergolas on April 22, 2019 by Decks, Decks and More Decks. A new elite deck adds tons of value to your lifestyle. Not only that, but investing in a new deck adds value to your home. Decks are typically in the top three for return on investment. Compared to an addition or attic, building a deck costs a lot less, but provides one of the top ROI’s of any remodel project. According to Remodeling Magazine’s Cost vs. Value Report, a homeowner can recoup an average return of 80% on a new deck. A family room addition averages only 69%. We’ve built plenty of custom decks in Omaha over the years, and have seen what it can do for resale value. Using high-quality composite materials create a deck that will pass the test of time. Composite materials add significant value because of their durability, aesthetics, and low maintenance requirements. To get the greatest value, your deck should be big enough to use as a comfortable entertainment space. Most people want a deck to enjoy barbecuing and sharing relaxed outdoor time with family and friends. It should have enough space for a grill and a large table with chairs, and some storage space doesn’t hurt. Making your deck easy to access helps improve its value. A deck that can be accessed from the first-floor kitchen or living room is a lot more impressive to people than a deck built off a master bedroom on the second floor. Kitchen access is desirable because it makes it easy to bring food and other items in and out when you’re entertaining family and guests. If your deck has an impressive design, with custom railing, and a strategic layout it’s going to be more fun for you and attractive to future potential buyers. The wow factor of a custom built deck can often be the tipping point that will influence someone to want to buy your home. Remember, when you’re budgeting for a deck make sure to factor in a recoup value of 70-80%. Take into consideration the size and value of your house pre-deck. Choose a deck design and size that makes sense for your home’s size and style. Before you sign with any deck builder go to their showroom and see the materials in person. It’s one thing to see pictures online, but when you see it in person, you can touch it, and see how it looks in different lighting. If you stop by our showroom, we can walk you through all of the best options that will fit your budget, and even show you how our design models work. You might not commit to a new deck, but you’ll leave with a lot of knowledge that will make you an informed buyer when you decide to move forward with your new deck construction. This entry was posted in Custom Decks Omaha and tagged custom deck builder, custom deck contractor, custom decks omaha on March 31, 2019 by Decks, Decks and More Decks. 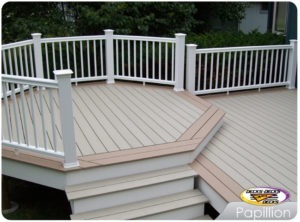 Decks, Decks and More Decks prides itself on the quality craftsmanship of our Omaha custom decks. But quality craftsmanship is nothing without quality material. As a platinum ranked AZEK contractor we show commitment to providing the best and most beautiful decking material on the market. With an enhanced real-wood look and strength backed by Alloy Armour Technology™, AZEK’s capped polymer decking materials are top of the line in quality and beauty. AZEK’s decking is proven to stand against harsh weather, stains, fading and scratching. It’s low-maintenance decking material requires no annual sealing and staining, and it is mold, mildew and moisture damage resistant. As a platinum ranked contractor with AZEK, Decks, Decks and More Decks has shown commitment to integrity and quality. Our custom deck builders are experts in design, material and construction, and it is our promise that we will continue to seek the education necessary to bring our Omaha customers the best technology for their custom decks. AZEK decking is backed by a 30-year limited fade and stain and a limited lifetime warranty for cracking, cupping, and more. Call Decks, Decks and More Decks today for a free Omaha custom deck quote and to learn more about AZEK’s quality materials. This entry was posted in Custom Decks Omaha and tagged AZEK omaha, custom deck builder, custom decks omaha on February 16, 2017 by Decks, Decks and More Decks. At Decks, Decks and More Decks, we strive to provide Omaha homeowners with beautiful, quality custom decks. Our longevity and experience in the deck building industry partnered with our quality, low-maintenance deck materials make this a reality. But on top of these things lies our customer service and our diligence in making sure Omaha homeowners are an integral part of the custom deck building process. is well-spent from start to finish. At Deck, Decks and More Decks we realize that while this is the case – a homeowner’s time is valuable, and money and time should be respected. So when you schedule a consultation with us, we make efficient use of time. By visiting the property before a sit-down meeting, it allows us to gain a better understanding of the project. Then, homeowners come to our office where we build a 3D rendering of a custom deck built to your specific needs. It’s always helpful to see a product before purchasing it. As a company that values homeowner’s needs and opinions, our custom deck building process is completely tailored to ensure customer satisfaction from start to finish. Please contact us to get your custom deck project started before spring! This entry was posted in Custom Decks Omaha and tagged custom deck builder, custom deck contractor, custom deck omaha, low-maintenance deck on March 11, 2015 by Decks, Decks and More Decks. As summer approaches in Omaha, cabin fever is setting in and thoughts of outdoor entertaining and fun come to mind. At Decks, Decks and More Decks, it’s our goal to provide Omaha homeowners a place for families to enjoy the outdoors together; making summer entertainment easy and beautiful. Our custom decks are built uniquely for each home, giving homeowners an opportunity to select style, material and accessories. When it comes to outdoor entertainment, decking for pools and spas are particularly custom task, built for fun and safety. A deck which must hold spa weight is built differently than a regular custom deck and should also be built around access points and pumps. Additionally, a custom pool or spa deck should be constructed using specific materials, in an effort to prevent rot and discoloration. Moisture and chemicals can cause unintended aesthetic and safety issues. Decks, Decks & More Decks are expert custom deck contractors in low-maintenance decks, which are the perfect choice for a pool or spa deck. With no cracks or splinters, our low-maintenance wood-alternative custom decks are the perfect addition to keep your family having fun and safe this summer. This entry was posted in Custom Decks Omaha and tagged custom deck builder, custom deck omaha, custom pool deck omaha on March 3, 2015 by Decks, Decks and More Decks.